Bumblebees are seeing their ranges in North America and Europe rapidly disappear due to climate change and some species could be driven into extinction by the warmer temperatures. A study examined historical and current records of bumblebee movements over the past 110 years and found they have lost about 185 miles of territory from the southern edge of their ranges in Europe and North America. Much of that loss for the 31 species in North America and 36 species in Europe studied was due to increased warming brought about by rising greenhouse gas emissions from the burning of fossil fuels. This was on top of other threats the bees already face like habitat destruction and exposure to a range of agriculture pesticides. "This was a surprise," said Leif Richardson, a scientist at the University of Vermont who helped lead the new research. "The bees are losing range on their southern margin and failing to pick up territory at the northern margin - so their habitat range is shrinking." "The scale and pace of these losses are unprecedented," Jeremy Kerr, a biologist from the University of Ottawa, who led the new study, added. "Pollinators are vital for food security and our economy, and widespread losses of pollinators due to climate change will diminish both," he said. "We need to figure out how we can improve the outlook for pollinators at continental scales, but the most important thing we can do is begin to take serious action to reduce the rate of climate change." Bumblebees are just the latest species to pay a price for a warming world. Animals from polar bears to butterflies to birds are seeing their ranges shrink or shift towards the polar region or higher elevations in response to changes in climatic conditions. "This paper is important because it reinforces the understanding that species will not all be able to shift their ranges in order to adapt to a changing climate," Sacha Vignieri, an associate editor for the journal Science, said. The bumblebees, the study found, are shifting to areas of habitat at higher elevation in response to climate change; the southern range populations where temperatures are higher are retreating up mountainsides and away from the equator. Northern populations, meanwhile, are failing to take advantage of temperatures that have increased 3.6 degrees to colonize new areas. "Global warming has trapped bumblebee species in a kind of climate vise - the result is dramatic losses of bumblebee species from the hottest areas across two continents," Kerr said. "For species that evolved under cool conditions, like bumblebees, global warming might be the kind of threat that causes many of them to disappear for good." Among the questions is why the bees in northern ranges aren't moving. "We don't know for sure what is causing a stagnation at the northern end of things. Bees should be able to start new colonies in places they did not historically occupy," University of Calgary's Paul Galpern, a co-author on the study, said. 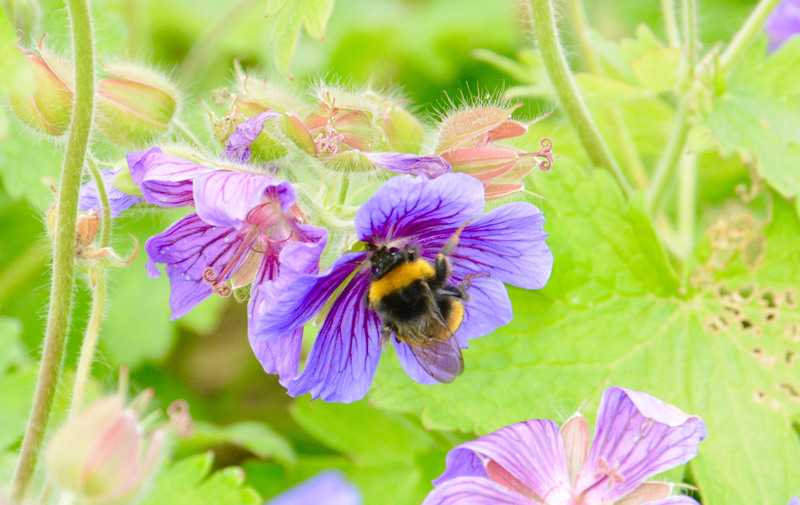 The new study is also expected to reignite the debate over the role pesticides are playing in the deaths of bumblebees and other bee species, especially honey bees. Starting in 2006, the rates of dead bees almost tripled due to a condition called colony collapse disorder or CCD. A nationwide survey in May found that beekeepers across the United States lost more than 40 percent of their honeybee colonies between April 2014 to April 2015. Scientists have long struggled to identify the cause of the bee die-off, which threatens the nation's $2.75 million of managed colonies and could one day impact the nation's food supply since bees are crucial to pollination. The economic value of bee pollination services ranges from $10 billion to $15 billion. Some of the deaths have been blamed on the varroa mite, a lethal parasite that can easily spread between colonies. Others have singled out a class of pesticide called neonicotinoids, or "neonics," which have been shown to disrupt a honeybees ability to seek out flowers. One study found that bumblebees in fields treated with the pesticide didn't grow, while those in pesticide-free fields did grow. The researchers didn't discount the impact of the pesticides on bumblebees but suggested they didn't play a role in their shrinking ranges. "The question is: Have neonicotinoids or other pesticides caused a huge range loss we observed in this study? And the answer clearly now is no," University of Ottowa's Alana Pinard, another co-author on the study, said. "And we checked this carefully. In fact, bumblebee range losses began before neonicotinoids were in wide use. This cannot be interpreted to mean that neonicotinoids do not and cannot harm bees, just that they do not affect our results. In this study we show that they are impacted by climate change and that these effects are already very large and widespread, and it is probable that these losses will increase in the future." The researchers are calling for a number of steps to halt the range losses of these plump, yellow and black bees. Among them is encouraging gardeners to plant more native wildflower, convincing governments to conserve more of their natural habitats and considering moving bee populations into new areas where they might persist - a controversial strategy known as assisted migration. "We need new strategies to help these species cope with the effects of human-caused climate change, perhaps assisting them to shift into northern areas," Kerr said.